This step is super simple: start mixing the pre-measured ingredients (flour, cocoa powder, sugar, baking powder, butter, oil, eggs) in the mixing bowl, and when they are mixed together, add milk with vanilla extract and mix everything together for a smooth, cream-like texture. 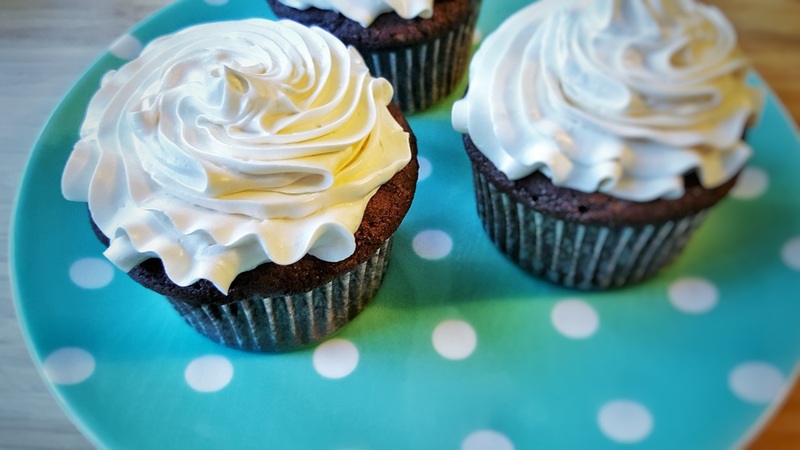 Lay two 12-cupcake baking forms with paper forms, and fill them evenly to 2/3-3/4 of the height with the batter. Using the swiss-meringue buttercream recipe, prepare it with the pre-measured ingredients (egg whites, sugar, butter, golden syrup).